July 2018 – Loath to Close … Still! You’ve heard of Abraham Lincoln’s Gettysburg Address, maybe even memorized it. You might also know about his “House Divided” speech, his Cooper Union speech, and his two inaugural addresses. Yet some claim that Lincoln’s greatest speech wasn’t any of these, but rather one you’ve never read nor recited, for the simple reason that it was lost to history. It is known simply as the “Lost Speech”, and it was delivered at Bloomington, IL on May 29, 1856 at an exceedingly tense and tumultuous time. Two years previous, the great slavery debate had exploded in greater furor than ever before due to Senator Stephen Douglas’s Kansas-Nebraska Act. Up to that point, slavery had been contained in just one part of the country with the hope, and the expectation, that one day the nation might be rid of it entirely; now slavery would be allowed to spread into the west and even into the north, and we might never be rid of it. This prompted an entire re-ordering of the political landscape. Prior differences between Democrats and Whigs over other issues moved to the background as the defining issue now became whether one was for or against Douglas’s bill. The Whig Party soon collapsed under the weight of the situation, and there emerged a movement to gather all the “anti-Nebraska” forces – i.e., all those who were opposed to the extension of slavery – into one political force, if not one entirely new political party. By early 1856, a presidential election year, this movement was coalescing under the name “Republican”. The new party would hold its first-ever national convention in the middle of June in Philadelphia to nominate candidates and adopt a platform. State conventions were likewise called in many of the northern states; in Illinois, it was decided to hold the convention in Bloomington on May 29. During the week leading up to the Bloomington convention, the tensions suddenly escalated significantly. Senator Charles Sumner of Massachusetts was brutally beaten on the Senate floor by South Carolina Congressman Preston Brooks in retaliation for Sumner’s speech denouncing the Kansas-Nebraska Act, in which he also mocked Brooks’ cousin, Senator Andrew Butler; the outrage in the North was loud and strong, while in the South, Brooks was praised. Meanwhile, out in Kansas, the anti-slavery stronghold of Lawrence was ransacked by pro-slavery ruffians, and three days later a group of men led by John Brown retaliated by killing five pro-slavery settlers north of Pottawatomie Creek; “Bleeding Kansas” was well underway. And right here in Illinois, an anti-slavery editor named Paul Selby, who would have been one of the leaders of the Bloomington convention, was viciously attacked by pro-slavery sympathizers and now lay at home recovering from his injuries. Amid all this tension, the Bloomington convention did its work, hearing speeches, nominating candidates, and adopting resolutions. Lincoln chaired the nominating committee for state offices and was named a delegate to the upcoming national convention – an honor he would have to decline because he had neither the time nor the money to attend – as well as a statewide elector-at-large for the Presidential election. But he was passed over for what he would have most desired: an opportunity to address the crowd. As the convention drew to a close around 5:30 pm, however, many of the delegates and visitors were in no mood to leave, and a crowd of over a thousand men was still gathered in and around the hall. It was then that some of them started calling out for Lincoln. They may have only wanted some of his funny stories, but what he gave them instead was a rousing, hour-and-a-half-long speech. It is just as likely, however, that Lincoln and other party leaders deliberately suppressed its publication, given that he directed his words to a highly partisan crowd. In an election year, it wasn’t the kind of message that would have been politically expedient to share with a broader audience. Lincoln’s primary objective seems to have been to unite all the disparate elements then coalescing into the new Republican Party, inspiring them to put aside their differences and commit wholeheartedly to the movement to fight against the extension of slavery. The increasingly violent slave power must be resisted, Kansas must be free, republican principles must be preserved, and the Union must be maintained. Although Lincoln’s original speech was ‘lost’, I’m pleased to report that an audience at “Lincoln’s Festival on Route 66” in that very same city of Bloomington was treated to a re-creation of it this past Sunday! That’s right, I found everything I could about it and pieced together what I think is a reasonable facsimile, although abridged to about half an hour. With the introductory and concluding material, it made a nice hour-long program, which I am now offering to whomever wants to see it so that they might decide for themselves whether it really was Lincoln’s greatest speech ever. 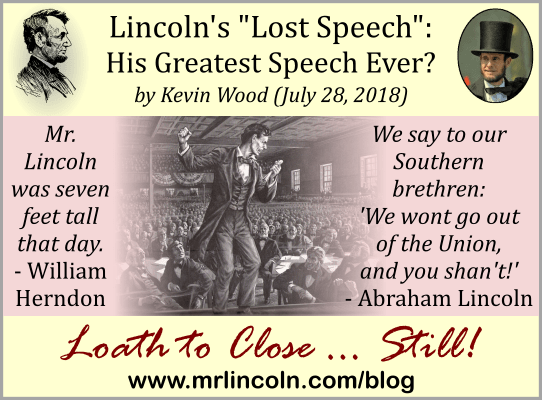 Posted on July 28, 2018 1 Comment on Lincoln’s “Lost Speech”: His Greatest Speech Ever? Vous avez entendu parler de l’adresse de Gettysburg d’Abraham Lincoln, peut-être même la mémorisé. Vous pourriez également être au courant de son discours « Une maison divisée », de son discours de Cooper Union et de ses deux discours inauguraux. Pourtant, certains prétendent que le plus grand discours de Lincoln n’était pas un de ceux-là, mais plutôt un discours que vous n’avez jamais lu ni récité, pour la simple raison qu’il a été perdu dans l’histoire. Il est connu simplement comme le « Discours perdu », et il a été prononcé à Bloomington, IL le 29 mai 1856 à un moment extrêmement tendu et tumultueux. Le nouveau parti républicain avait été formé pour lutter contre l’extension de l’esclavage à l’ouest et le nord, et la première convention d’état républicain de l’Illinois avait lieu à Bloomington ce jour-là. Lincoln a été très impliqué dans la convention, mais il a été court-circuité pour ce qu’il aurait souhaité le plus : une occasion de s’adresser à la foule. Comme la convention tirait à sa fin vers 17h30, cependant, certains des hommes ont commencé à appeler pour Lincoln pour qu’il parle. Cependant, il est tout aussi probable que Lincoln et les autres dirigeants du parti aient délibérément supprimé sa publication, étant donné qu’il a dirigé ses paroles à une foule très partisane. Dans une année électorale, ce n’était pas le genre de message qui aurait été politiquement opportun de partager avec un public plus large. Mais cela ne signifie pas que les journaux, ainsi que les individus, n’ont pas rendu compte du discours de Lincoln. Herndon l’a appelé « plein de feu et d’énergie et de force : c’était de la logique ; c’était du pathos ; c’était l’enthousiasme ; c’était la justice, l’équité, la vérité et le droit embrasés par les feux divins d’une âme rendue folle par le mal ; il était dur, lourd, épineux, noueux, soutenu par la colère ». Le principal objectif de Lincoln semble avoir été d’unir tous les éléments disparates coalescents puis dans le nouveau Parti républicain, en les incitant à mettre de côté leurs différences et à s’engager sans réserve dans le mouvement de lutte contre l’extension de l’esclavage. Le pouvoir esclavagiste de plus en plus violent doit être combattu, Kansas doit être libre, les principes républicains doivent être préservés et l’Union doit être maintenue. Bien que le discours original de Lincoln a été ‘perdu’, je suis heureux d’annoncer que le public au « Lincoln’s Festival on Route 66 » dans cette même ville de Bloomington a eu droit à une recréation de celui-ci le dimanche dernier ! C’est vrai, j’ai trouvé tout ce que je pouvais à son sujet et j’ai reconstitué ce que je pense être un fac-similé raisonnable, bien qu’abrégé à environ une demi-heure. Avec le matériel d’introduction et de conclusion, c’est fait un beau programme d’une heure, que j’offre maintenant à qui veut l’entendre afin qu’ils puissent décider eux-mêmes si c’était vraiment le plus grand discours de Lincoln jamais. El “discurso perdido” de Lincoln: ¿El mejor discurso de su vida? Ud. ha oído hablar del discurso de Gettysburg de Abraham Lincoln, tal vez incluso lo ha memorizado. También puede saber de su discurso “Casa dividida”, su discurso de Cooper Union y sus dos discursos inaugurales. Sin embargo, algunos afirman que el mejor discurso de Lincoln no fue ninguno de estos, sino uno que Ud. nunca ha leído ni recitado, por la sencilla razón de que se perdió en la historia. Se lo conoce simplemente como el “Discurso perdido”, y fue dado en Bloomington, IL el 29 de mayo de 1856 en un momento extremadamente tenso y tumultuoso. Dos años antes, el gran debate sobre la esclavitud había estallado con mayor furia que nunca debido a la Ley Kansas-Nebraska del Senador Stephen Douglas. Hasta ese momento, la esclavitud había sido contenida en solamente una parte del país con la esperanza, y la expectativa, de que algún día la nación podría librarse por completo de ella; ahora se permitiría que la esclavitud se extendiera hacia el oeste e incluso hacia el norte, y podría ser que nunca nos libremos de ella. Esto provocó un reordenamiento completo del panorama político. Las diferencias anteriores entre demócratas y whigs sobre otros temas pasaron a un segundo plano, ya que ahora la cuestión definitoria se convirtió en si uno estaba a favor o en contra del proyecto de ley de Douglas. El Partido Whig pronto colapsó bajo el peso de la situación, y surgió un movimiento para reunir a todas las fuerzas “anti-Nebraska” – es decir, a todos aquellos que se oponían a la extensión de la esclavitud – en una sola fuerza política, si no en un partido político enteramente nuevo. Para principios de 1856, un año de elecciones presidenciales, este movimiento se estaba fusionando bajo el nombre de “republicano”. El nuevo partido celebraría su primera convención nacional a mediados de junio en Filadelfia para nombrar candidatos y adoptar una plataforma. Asimismo, convenciones estatales fueron convocadas en muchos de los estados del norte; en Illinois, se decidió celebrar la convención en Bloomington el día 29 de mayo. Durante la semana previa a la convención de Bloomington, las tensiones aumentaron repentinamente de manera significativa. El senador Charles Sumner de Massachusetts fue brutalmente golpeado en el Senado por el congresista Preston Brooks de Carolina del Sur en represalia por un discurso de Sumner denunciando la Ley Kansas-Nebraska, en el que también se burló del primo de Brooks, el senador Andrew Butler; la indignación en el Norte fue clara y fuerte, mientras que en el Sur, Brooks fue elogiado. Mientras tanto, en Kansas, la fortaleza antiesclavista de Lawrence fue saqueada por rufianes proesclavistas, y tres días después un grupo de hombres liderados por John Brown tomó represalias matando a cinco colonos proesclavistas al norte de Pottawatomie Creek; “El Kansas sangrante” estaba en plena marcha. Y aquí mismo en Illinois, un redactor antiesclavista llamado Paul Selby, quien hubiera sido uno de los líderes de la convención de Bloomington, fue brutalmente atacado por simpatizantes proesclavistas y ahora estaba en casa recuperándose de sus lesiones. En medio de toda esta tensión, la convención de Bloomington hizo su trabajo, escuchando discursos, nombrando candidatos y adoptando resoluciones. Lincoln presidió el comité de nominaciones para los cargos estatales y fue nombrado un delegado a la venidera convención nacional – un honor que tendría que rechazar porque no tenía ni el tiempo ni el dinero para asistir – así como un elector en general a nivel estatal para la elección presidencial. Pero lo pasaron por alto por lo que hubiera deseado más que nada: una oportunidad para dirigirse a la multitud. Sin embargo, mientras la convención se acercó a su fin alrededor de las 17:30 horas, muchos de los delegados y visitantes no estaban de humor para irse, y una multitud de más de mil hombres se encontraba todavía en y alrededor de la sala. Fue entonces cuando algunos de ellos comenzaron a pedir que Lincoln hablara. Puede ser que solamente quisieran algunas de sus historias divertidas, pero lo que les dio en vez de esto fue un discurso emocionante de hora y media de duración. Sin embargo, es igualmente probable que Lincoln y otros líderes del partido suprimieran deliberadamente la publicación de su discurso, dado que dirigió sus palabras a una multitud altamente partidista. En un año electoral, no era el tipo de mensaje que habría sido políticamente conveniente compartir con una audiencia más amplia. El principal objetivo de Lincoln parece haber sido el de unir a todos los elementos dispares que entonces se unían en el nuevo Partido Republicano, inspirándoles a dejar de un lado sus diferencias y a comprometerse de todo corazón al movimiento para luchar contra la extensión de la esclavitud. El poder esclavista cada vez más violento debe ser resistido, Kansas debe ser libre, los principios republicanos deben ser preservados y la Unión debe mantenerse. Aunque el discurso original de Lincoln fue ‘perdido’, me complace informar que una audiencia en el “Festival de Lincoln en la Ruta 66” en esa misma ciudad de Bloomington experimentó una recreación de él el domingo pasado. Así es, encontré todo lo que pude sobre él y reconstruí lo que creo que es un facsímil razonable, aunque abreviado a una media hora aproximadamente. Con el material de introducción y conclusión, se hizo un lindo programa de una hora, lo cual ahora estoy ofreciendo a quien quiera verlo para que puedan decidir por sí mismos si realmente fue el mejor discurso de Lincoln de toda su vida. 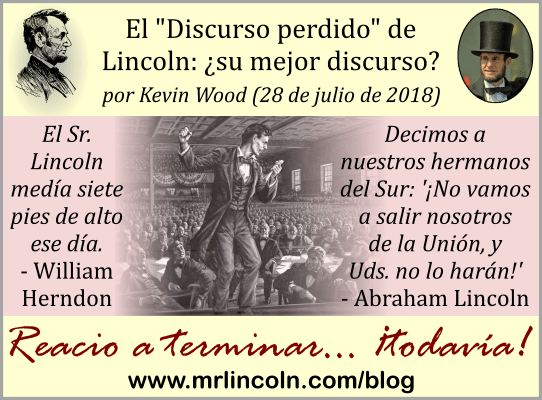 Posted on July 28, 2018 Leave a comment on El “discurso perdido” de Lincoln: ¿El mejor discurso de su vida?